Fairs & Festivals are opportunities to meet each other. In the ancient time, when there were no such facilities of communication and transport, these fairs and festivals have played an important role in social gathering and meeting with relatives, friends resided in the far-away geographical locations. Together with recreation, these have social significance to remember the religious importance and social messages behind these events. Most of the festivals of the region are based on mythological traditions. Makar Shankranti’, also called ‘Uttarayni’ in Garhwal, is celebrated as ‘Khichriya Shankranti’ in which ‘Khichri’ of ‘Urad Dal’ is prepared and Rice & ‘Urad Dal’ is donated to the Brahmins. On this day, ‘Gindi’ fairs are organized in different places like Dadamandi, Thalnadi etc. of the district. On ‘Basant Panchami’, also called ‘Sripanchami’, the worships of ‘Kshetrapal’ or ‘Bhumiya’ Devtas are organized and the group folks ‘Thadiya’ and ‘Chauffula’ are started. On ‘Vishuvat Shankranti’, the new year starts and it is celebrated as ‘Vikhoti’. In some places like Trivani near Pokhal, Devalgarh etc., fairs are organized on this day. Similarly, ‘Holi’, ‘Deepawali’, ‘Shivratri’, ‘Vijayadhasmi’, ‘Rakshabandhan’ are organized with full joys as per Hindu traditions. On the day of ‘Makar Shankaranti’, ‘Gindi’ fairs are organized at some places in the southern part of the district. These fairs have its own distinctiveness and importance in the hills. As the month of ‘Magha’ starts, a number of fairs are organized in whole area, but the ‘Gindi’ fairs of ‘Dandamandi’ & ‘Thalnadi’ are most famous in which people from the remote and far-away places are participated. These fairs are symbols of bravery, joy, courage & competitive spirits, in which two teams of the villagers are formed to participate in the game of specific kind of ball in a plain ground. In this game, each team try to pull the ball in its side and the winning villagers carry the ball with celebrations and dances. 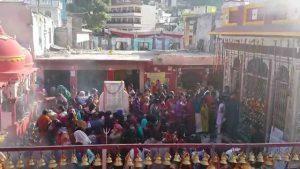 On the occasion of ‘Shukla Chaturdashi’ of Kartik month, also called ‘Vaikunth Chaturdashi’, a fair is organized at the Kamleswar Mahadev Temple of Srinagar which is not only for recreations & entertainments but also attached with some traditions. On the night of ‘Vaikunth Chaturdashi’, this temple witnesses scores of childless couples praying with lighted ‘Diya’ for fertility. It is said that Lord Shiva always answers their prayers. 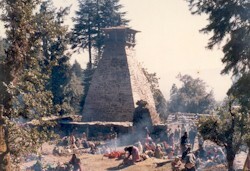 Earlier, this fair was organized for single day in the temple campus. Now, it is extended to five days by ‘NagarPalika, Srinagar’ with including a number of other activities. 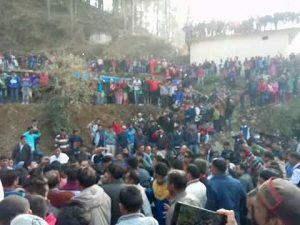 Every year on ‘Vaikunth Chaturdashi’ & ‘Kartik Purnima’, a two days ‘Binsar Mela’ is organized at ‘Bindeswer Mahadev’ temple situated at the remote & district border area between ‘Chauthan Patti’ & ‘Dhoodatoli’ forests in which people from different areas of the Districts Pauri, Chamoli, Almora and Rudraprayag are participated and worshipped God Shiva. Because of this, the fair witnesses a fine mixture of cultural heritages of Garhwal & Kumoun regions. On this occasion, the people are assembled and participated in cultural programmes in which ‘Pandav’ & ‘Chaufula’ dances, ‘Mangal’ & ‘Khuded’ songs etc. are performed on the rhythm of traditional musical instruments by awakening whole night.